Fletcher Vredenburgh has long blogged about swords & sorcery and other assorted awesome things at his own site Stuff I Like and Black Gate. He also hosts a loud radio show, Music I Like on Maker Park Radio. He persisted nonetheless. He dropped out of college and, deciding it was the easiest way to gain the sorts of experiences a writer needed, joined the army. Alexander spent some of his WWII service time stationed in Wales. He fell in love with the countryside and with its myths. Drawing on both, he created the land of Prydain and spun a story of imagination and adventure. He recast the Welsh death god, Arawn, into a dark lord (not a common fantasy trope at the time), and assembled bits and pieces from assorted legends into something we’d recognize today as high fantasy. It took him a long time to find his way to fantasy and children’s books. For nearly fifteen years Lloyd Alexander toiled away, writing straight fiction, nonfiction, even translation. (Vladimir Nabokov in a New York Times review of Sartre’s novel, Nausea, ridiculed Alexander’s translation, declaring it filled with blunders.) It was only as he neared forty that he tried his hand at a book aimed at children. His 1963 book Time Cat was a success, and set his path for the rest of his career. I discovered the Chronicles of Prydain during high school while I was working in the local library. I was already a longtime reader of fantasy and a quick scan of the dust jacket of The Book of Three (1964), was enough to make me pick it up. I don’t remember how fast I read it, but I think I finished it and its four sequels within two weeks. Over the decades I’ve reread them many times. To this day, the final pages of the concluding book, The High King, can get me all misty-eyed. I envy anyone who gets the joy of discovering them for that very first time. Together, The Book of Three, The Black Cauldron (1965), The Castle of Llyr (1966), Taran Wanderer (1967) and The High King (1968) tell the story of the rise of the young orphan Taran from Assistant Pig-keeper to High King. Much like with J.K. Rowling’s Harry Potter decades later, with each book Taran ages and the themes become more mature. In the first two books, Taran is driven by a desire to be a hero, but is forced to face up to the demands and limits of leadership as well as the real possibility of death. As he matures, he learns that what makes a hero isn’t his lineage or his sense of destiny, but being able to do the right and needed thing when it matters, despite the risks and cost. The Chronicles of Prydain are powerful books. Each volume raises the stakes and forces Taran to face greater demands. He begins as a boy practically drunk on tales of dashing heroes and feats of glory; he ends as a man willing to bear every burden for the people and land he’s come to love. In the beginning he is impetuous and presumptuous; Taran assumes being a hero is all excitement and adventure. Alexander almost revels in dashing the boy’s dreams on the sharp rocks of reality. It’s experience and time that allow Taran to travel the path of heroism, not foolhardiness. The first two books are excellent tales of adventure, replete with zombie warriors, killer raptors, a wicked witch, and assorted grumpy fey folk and vile villains. While still tales of adventure and magic, the following three books are darker and weightier. As Taran’s story progresses, Prydain becomes a more somber, haunted world. Friends are secretly enemies and some enemies, friends. Responsibility means burden and sacrifice. This is tough stuff in what’re ultimately children’s books, but it is indicative of Alexander’s unwillingness to write down to his audience. Michael Moorcock in his infamous essay, “Epic Pooh,” declared Alexander’s writing to be cliché-filled and flaccid. He also declared the series aesthetically unsuccessful compared to those of the authors Alan Garner, Susan Cooper, and Ursula K. Le Guin. Having read those works, I disagree. As much as I like all three (Alan Garner’s young adult fantasies are among the most potently mythopoeic works I know), none of them has called me back as often or has left as indelible impressions scorched on me. As a teenager I was disappointed with the fourth book, Taran Wanderer. Convinced he must uncover his parentage, Taran undertakes a journey among the small villages and countryside of eastern Prydain. As he meets smiths, shepherds, and bandits, he is finally transformed from the boy of the first books into the man he needs to be for the concluding one. I was frustrated that there were fewer of the fantastic elements of the previous books. What I wasn’t seeing was the depth of character and weight Alexander was bringing to the tale. Looking at it nearly forty years later, I’m impressed with his ability to teach important lessons without ever slipping into didacticism. Taran’s future doesn’t depend on any genetic heritage, but on his ability to learn from people and to empathize with them enough to risk everything for them. That’s heady stuff for a kid to read, but I can’t think of a better time for someone to first hear that. In addition to eleven standalone novels, Alexander also wrote two other series. The first, Westmark, is a grim trilogy about revolution in the titular Ruritanian principality. The second is a six-book series of the Indiana Jones-esque adventures of Vesper Holly. 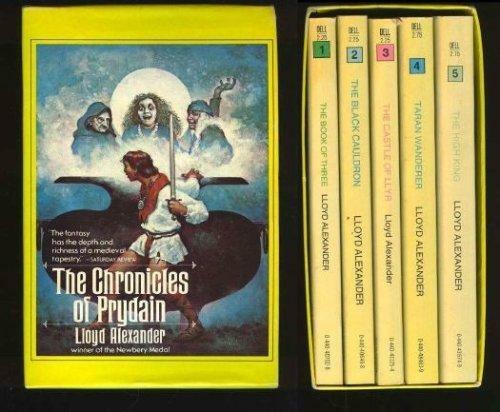 It’s the Prydain books that are of the most interest to the fantasy reader, and for which Alexander will be best remembered. If you’ve somehow missed Alexander’s Prydain books or avoided them because they’re listed as children’s books, don’t! They are some of the most exciting and affecting epic fantasy ever written. Relying not on thousands of pages of extraneous description and nonsense, but instead on deeply-felt and incredibly well-wrought storytelling, they burrow down deep into what it means to be a hero and, more importantly, what it means to be a man. P.S. There’s a sixth Prydain book, The Foundling and Other Tales of Prydain (1982). Told in a fairy tale style, these stories explore the history of Prydain and provide origins for many of its major figures. I strongly recommend it as well, but definitely wait until you’ve read the original five books. P.P.S. 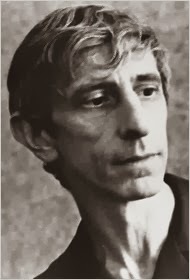 Here’s a LINK to an excellent documentary about Lloyd Alexander. It’s informative and very sweet. Clearly he was a man much loved. The film maker, Jared Crossley, also has a great site about the film and Alexander.